The Battle Of Nova Scotia takes to the stage for the final time in the 2018-19 regular season as the Eagles host the Mooseheads Saturday night at Centre 200. The Eagles are coming off a 4-0 loss Friday to Moncton. 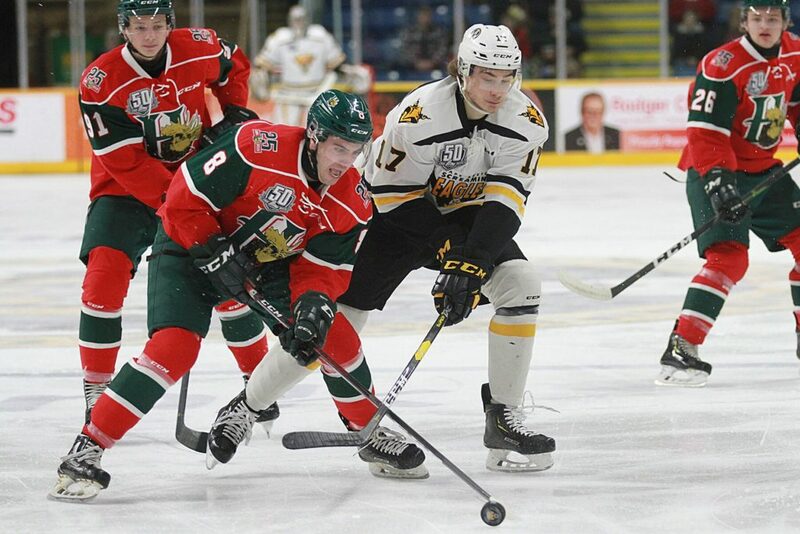 It was the third straight loss for Cape Breton but the Eagles picked up a point in a shootout in the prior two losses. Friday’s defeat ended a streak of seven games unbeaten in regulation for the Eagles. Halifax was not in action as their scheduled game against Bathurst was postponed due to weather issues, and the Mooseheads made the trek across the Causeway yesterday as a result. Halifax is tied for first in the Eastern Conference with a record of 37-11-3 (21-6 on the road) and is on a four game winning streak. The Eagles are in fourth place in the conference at 31-16-5. (16-8-3 at home). This season Halifax has won five of eight meetings, with each team needing extra time once for a win, and the Mooseheads winning three of four in Sydney (one of those victories coming in overtime). Last night’s loss was the first time in the 2018-19 season in which the Screaming Eagles were shutout, and it also brought an end to a four game goal scoring streak for Mitchell Balmas. Tonight’s game also marks the end of a five game home stand for Cape Breton. The Mooseheads received offense from both sides of the age spectrum in Wednesday’s win over Charlottetown. Overage forward Samuel Asselin notched an assist to push his point streak to 10 games (21 points during that streak) and put himself 7th in league scoring. Samuel Dubé, Halifax’s first round pick in 2018, also scored his first career goal. Dubé had missed three months of the season earlier this year due to a blood clot. Saturday’s game will be part of Hockey Day In Canada celebrations in the CBRM, and 500 youth tickets (under 21) will be priced at $5 on a first come, first serve basis. In addition, a special popcorn and pop special for youth will be offered at the game.